St George. In spite of its name, and its association with fire-breathing monsters, there was not a dragon in sight on either of our visits here, although I did hear the odd dubious remark around our campsite from time to time! 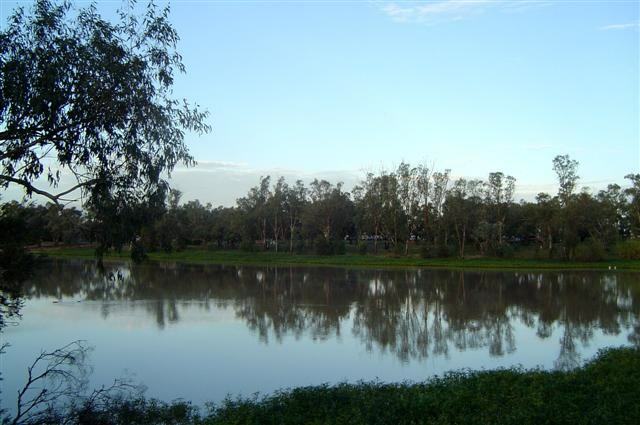 The town actually got its name when the explorer Sir Thomas Mitchell crossed the Balonne River and landed on this site on St. George’s Day, April 23rd,in 1846. On our first visit, back in 2003, we were tenting and were so impressed with our stay that we decided to return. A few things had changed this time, not the least of which was the “Wormpatch”. Back then, when John had asked where was the best place to buy bait for fishing, he was told that he had to dig for his own in the Wormpatch. But this time we couldn’t find it and I strongly suspect that it is now a park or part of a housing estate. 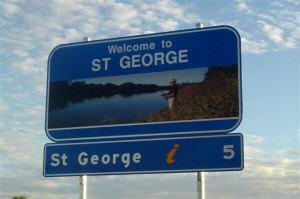 Yes, St George has grown remarkably in six years and the district now has a population of around 4000 people. Another of the changes here is at the St George Hotel. I remember our visit to the bistro for lunch and what a great place it turned out to be. The bistro was reminiscent of the old hotel foyers of the 1920’s. You know the kind, lots of potted palms, ceiling fans turning slowly, a couple of high-back cane chairs in the corner. I almost expected Peter Lorre or Sidney Greenstreet to walk in, dressed in a white suit, fedora in hand. It was that kind of place. by air conditioning, there’s not a potted palm in sight, and the chairs are functional steel and plastic. Who says progress is for the better! We arrived in St George on our second visit after a 4-hour drive from Cunnamulla that included stops for animals on the road, approximately 295 kilometres (183 miles) west of here. Some of those animals took their own sweet time in getting out of the way, too, but it wasn’t long before we were pulling into the driveway of the Pelican’s Rest Tourist Park ([star][star][star][star][star_half]) where we’d stayed on our first visit. The tourist park hadn’t changed; still the same great folks running the place, plenty of grass and roomy van sites, and lovely amenities. We wandered off down to the Visitor Information Centre to pick up some brochures and while there we picked up a bottle or two of Dragon’s Breath Sauce. This super-hot sauce makes Tabasco mild by comparison and where else, I ask you, would you expect to find such a throat-burning concoction but in a place called St George! kilometres (a little over a mile) from town. 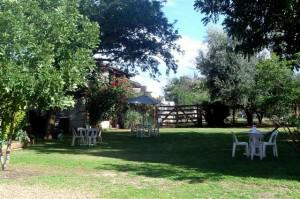 It is Queensland’s most western winery and is located on the banks of the Balonne River. Lunch in the gardens and a stroll along the river bank was what I wanted and I wasn’t disappointed. It was a perfect afternoon after the long drive this morning. Returning to camp late in the afternoon, we settled in for a quiet evening, our bottle of Two Tails Sparkling Wine chilling nicely for our first night ritual, a couple of steaks sizzling on the barbecue, and some pleasant conversation with our camping neighbours. Does it get any better than this? St George is a great base from which to explore the region and the little town of Surat is definitely worth some exploration. Only 115 kilometres (71 miles) from St George, it’s a sleepy little village nestled on the banks of the Balonne River and only an hour or so drive north. We arrived in Surat and stopped for a coffee before visiting the Cobb & Co Changing Station. 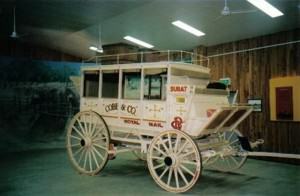 This is a museum dedicated to the days of old and is actually the former site of the depot where the coach drivers would change horses. Hence the name. There’s a tank inside the museum that holds the biggest Murray Cod that I have ever seen, not that I’ve seen one before but, as fish go, this was the granddaddy! However, our guide did point out that it isn’t the biggest one that’s ever been caught in these parts. I found the whole museum fascinating with its many historical artefacts, pictures, and stories; I could happily have stayed there all day. The displays of mining equipment from the early days of oil and gas exploration were remarkable and there were even newspapers from over the last hundred years or so right up until today including some interesting articles on a recent gas explosion that had almost been a major disaster in the town. In another part of the museum there was a huge display on the old Cobb & Co coaches that carried passengers and freight in this area as recently as the 1930’s and a fully restored coach that was almost a hundred years old. 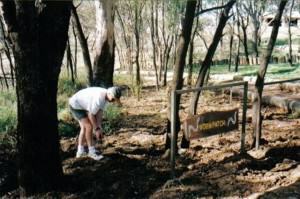 Behind the Changing Station is the Balonne River Gallery where local artists display their works in various exhibitions. The exhibition that we saw during our visit was called “Understorey” by local artist Victoria Arthur. Ms Arthur described her work as “A collection of sculptural pieces in clay– incorporating a variety of forms, techniques, and styles, unified by their multistorey construction, reflecting the idea that there is usually more than one layer, or level, to a structure; more than one side to a story, and always more than one way of looking at things.” John and I were entranced by the exhibition but disappointed that photography was not allowed. An arch of sandstone rocks was just one of her pieces and it was as perfect a display of balance as either of us had ever seen. The intricate detail must have taken her years and a lot of patience to complete. We were almost too scared to breathe around these sculptures as each single piece was secured in place only by the next piece. As I said, perfect balance, and one wrong move, a bump against a table, a slam of the door, could have seen it all come crashing down! beckoned. The dam, completed in 1972, holds more than 81000 megalitres (several billion gallons) of water and is one of the best fishing spots in St George, or so the locals say. 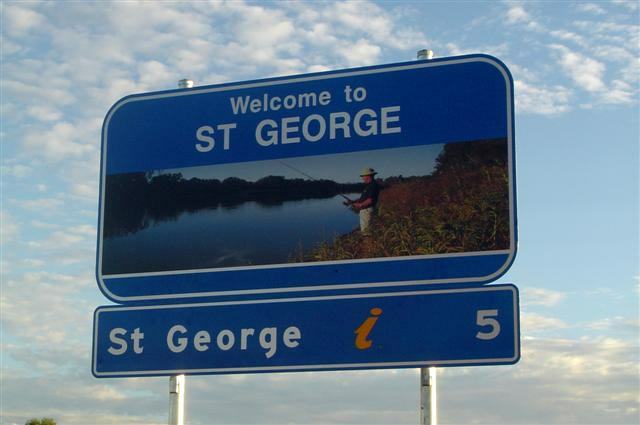 After all, St George is the fishing capital of inland Queensland. Well, John threw in his line and I got comfortable with a good book but, as I was discovering painfully, even in the late afternoon in May the Queensland sun has a bite to it. I could feel myself burning and so beat a hasty retreat to the car. Not for long, however, because then John caught his first fish. I don’t know what sort of fish it was but the water was so muddy from the recent rains that there was no way he was keeping it so back in it went. 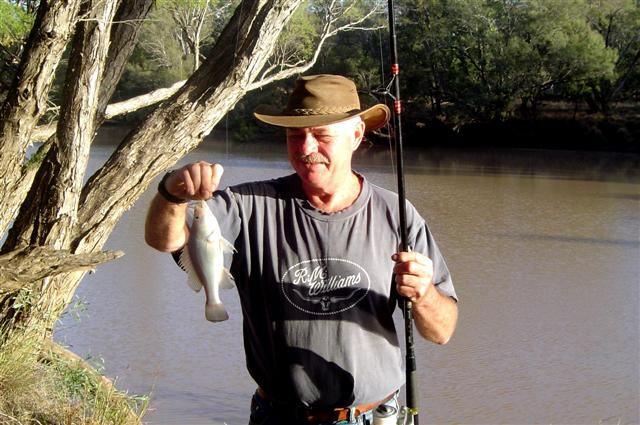 Two or three more followed the same way until finally he caught a Yellowbelly which, I believe, is a golden perch. It also lived to see another day. crossing is via the Andrew Nixon Bridge. Completed in 1953, it replaced the original timber bridge that had been built in 1890 by Andrew Nixon, the original owner of the largest property in the shire. 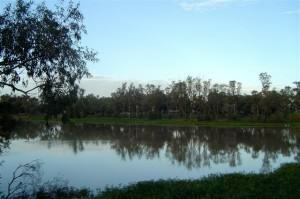 Queensland not far from the New South Wales border and is the administrative centre for the Shire of Balonne. Our second visit here had come to an end and it was time to say farewell to this pretty little town. From the purple and white flowered bauhinias lining Victoria Street to the brilliant display of jacaranda trees, St George really is a beautiful town and one well worth seeing. 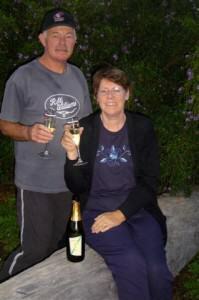 Both our visits here have been great and we were sorry to be leaving again so soon. But, who knows, perhaps one day we’ll be back. I certainly hope so.